Heat oven to 400°F. In large bowl, stir together baking mix, Cheddar cheese, sun-dried tomatoes, olives, salami, cornmeal, onion powder, Italian seasoning and 2 tablespoons of the Parmesan cheese; add buttermilk. Stir just until soft dough forms. Place dough on lightly floured surface. On ungreased cookie sheet, roll or pat dough into 8-inch round. Cut into 8 wedges but do not separate wedges. Brush with oil; sprinkle with pepper and remaining 1 tablespoon Parmesan cheese. Bake 15 to 20 minutes or until golden brown. Carefully separate wedges; serve warm with pizza sauce. 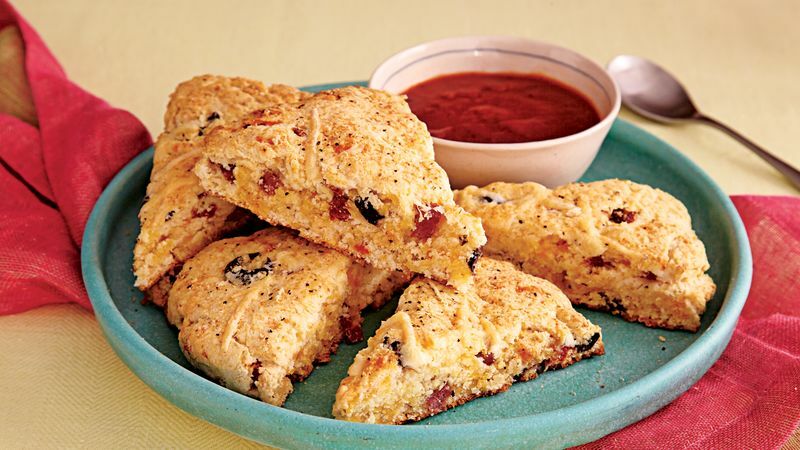 To Freeze: Freeze cooled baked scones in resealable freezer plastic bag up to 1 month. Thaw in refrigerator 8 hours. To reheat, place on cookie sheet. Bake at 350°F for 10 minutes.